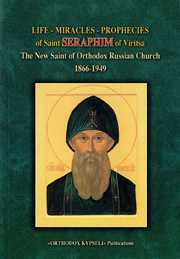 The New Saint of the Orthodox Russian Chruch. Translated from the Greek by Fr. Nicholas Palis- 147 pgs. St. Seraphim is a contemporary sanctified figure of the Russian Church adorned especially with the grace of prophecy and miracle working.